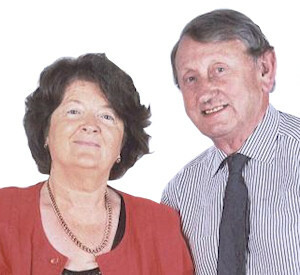 John and Philomena O'Sullivan, bought Woodlands Country House Bed And Breakfast, the year they married. Built in 1836 they have lovingly restored it over the years and turned it into one of the most luxurious period house accommodation not just in Gorey or Wexford but in all of Ireland. Philomena has a keen eye for antiques and has quite a collection, and John is an avid gardener in his spare time. Philomena loves meeting new people and always welcomes her guests with complimentary tea, coffee, hot scones and home preserves, and most importantly, a friendly chat. She will also advise you on where to travel and the best sights to see in the area... she will plan your route with you and also advise you on the best accommodation on route. Complimentary Tea / Coffee is available at any time in the gardens. John has retired .... we say retired but you can't keep a good man down.... he's in the garden growing flowers, shrubs and veggies !! John is a great man about the house, and loves his home and gardens. Take a stroll with him and he will be only delighted to tell you about his home and the wonderful gardens he has brought to maturity over the years. Killinierin, Gorey, Co. Wexford, Ireland.